Are Stink Bugs Bugging You? Are Wasps the Solution? As temperatures cool, many of you probably have had to share your homes with bugs. One of the most notorious of these squatters is brown marmorated stink bug (BMSB) (Fig. 1). It is also a serious pest of many economically important crops. Paula Shrewsbury and I are interested in developing sustainable pest management practices for BMSB, particularly biological control using small wasps (Fig. 2). These critters are also known as parasitoids, and they lay their own eggs inside a stink bug egg. The baby wasp (larva) inside the stink bug egg eats the developing stink bug. After about 10 days, the wasp larvae have become adults, chew their way out of the bug eggs, and fly off to look for new bug eggs to parasitize! Stink bugs do not hatch from the eggs where wasps emerged (see the video at the end of this post). Fig. 1 An adult brown marmorated stink bug, Halyomorpha halys. Photo by David R. Lance, USDA APHIS PPQ from bugwood.org. In order to enhance biocontrol, we needed information about the wasp species that parasitize the eggs of all stink bug species in Maryland. We know that some wasp species seem to prefer parasitizing bug eggs along a wooded edge, while other wasps are more common in agriculture. However, these conclusions are based only on a few experimental plots. There are many more places and habitats to look for stink bugs and wasps. Frustratingly, it is not possible to be in more than one place at a time! We needed help looking for bug eggs (Fig. 3), so we decided to recruit from among UME Master Gardeners for Project Stink-be-Gone. Their experience and enthusiasm for plants, gardening, and the environment make them ideal volunteers to spend some summer hours hunting for bug eggs. After 44 UME Master Gardeners were recruited and trained, volunteers spent a minimum of one hour per week for six weeks looking for egg masses anywhere they wanted, as long as they were searching on host plants of stink bugs. While searching, they collected data about the habitat (woods, agriculture, etc). The host plant was identified if an egg mass was found. All samples were sent immediately to us in small plastic dishes. If wasps emerged from bug eggs, they would be contained inside the dish for identification. We have learned a great deal from the 301 samples of stink bug egg masses (Fig. 4)! Samples included egg masses from a variety of bug species, including BMSB, and nearly 40% of the egg masses showed either signs of predation (chewed eggs) or parasitism. We identified five genera of wasps, some of which are specialists on stink bug eggs, and others are less choosy in the eggs they will parasitize. 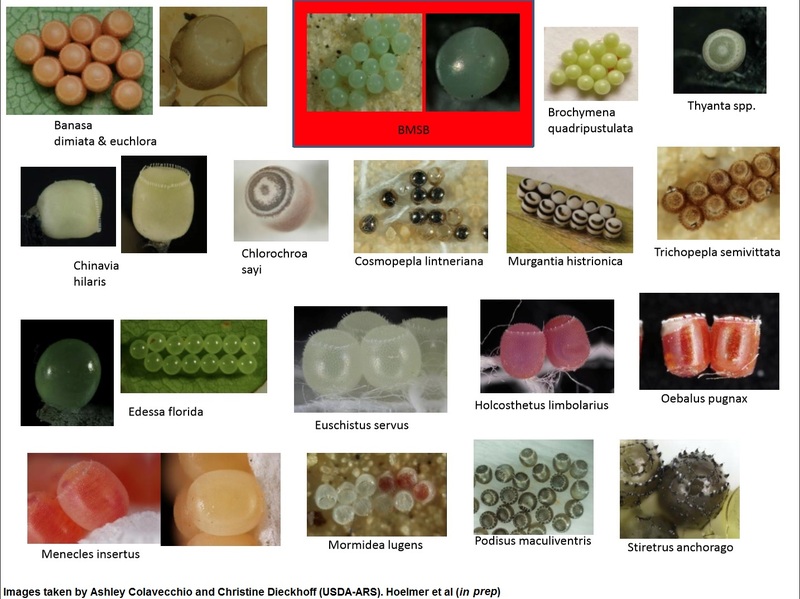 Nine percent of the samples included BMSB eggs, which were collected from 14 plant hosts, two of which had not been recorded as host plants for egg-laying. Lastly, UME Master Gardeners sampled across a much larger area than what I would have time to survey myself. There is still much to do, including identification of wasps to species to see if we have detected any new species attacking stink bug eggs. There is also a stack of datasheets an inch thick with habitat data to analyze and correlate with the presence or absence of bugs and wasps. I look forward to the challenges ahead and realize that my conclusions about biocontrol of stink bugs in Maryland would not be possible without the time and effort of UME Master Gardeners involved with Project Stink-be-Gone. Parasitic wasps, and what they do to other insects (like aphid) sounds like science fiction; like Alien!